It was an odd choice for a gift. Israeli Prime Minister Benjamin Netanyahu came to the White House carrying a book for President Barack Obama, an edition of the American humorist Mark Twain’s travels to the Holy Land. Twain didn’t like the place much; he wrote rudely about the Arabs and thought the Jews should not have their own nation. Was it a warning from Netanyahu, and if so, what was he saying? Not many laughs in the Middle East? It’s not the place you think it is? Stay away? Israeli journalists who attended the press briefing described the two men as “grim and formal,” as if they had both come away from the session with a newfound wariness of each other, like circling prizefighters. Obama wants to rally Arab nations to create a bloc against Iran’s nuclear ambitions, and he thinks that the only way to bring the Arabs on board is to achieve headway on the Israeli-Palestinian conflict. Netanyahu wants Iran defanged, but the hawkish Premier doesn’t see the linkup or why he needs to make concessions to the Palestinians, especially ones that might jeopardize Israel’s security. But in exchange for a tough U.S. line on Iran, will Netanyahu oblige the Obama Administration on the Palestinian issue Netanyahu will no doubt try the tactic used by previous Israeli Premiers, which is to stall, using the plausible excuse that Palestinians lack a coherent leadership. Netanyahu must also be wondering how hard Obama and a pro-Israel Congress will be willing to push its key regional ally. No doubt he will test Obama’s determination. At the White House press briefing, Obama came across as a man not easily deterred. He has his sights on a regional peace initiative, roping in moderate Arab states, which he will unveil on June 4 in Cairo. 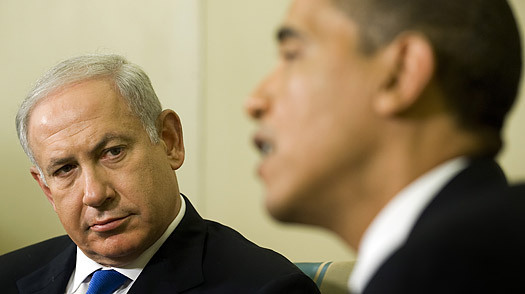 Obama knows that his plan will succeed or flop depending on Israel’s willingness to make concessions to the Palestinians. After Netanyahu’s trip, the Israeli public will brace for a tougher approach from Washington. A Haaretz cartoonist showed Obama escorting Netanyahu across the White House lawn and telling him, “You can take the subway to your hotel. Next time you’re around, give me a call.” This sort of casual send-off isn’t what Israeli leaders are accustomed to when visiting the White House.